TO: Mr. Gorden E. Eden, Jr.
FROM: Paul Andrew Mitchell, B.A., M.S. DATE: March 15, 2007 A.D. 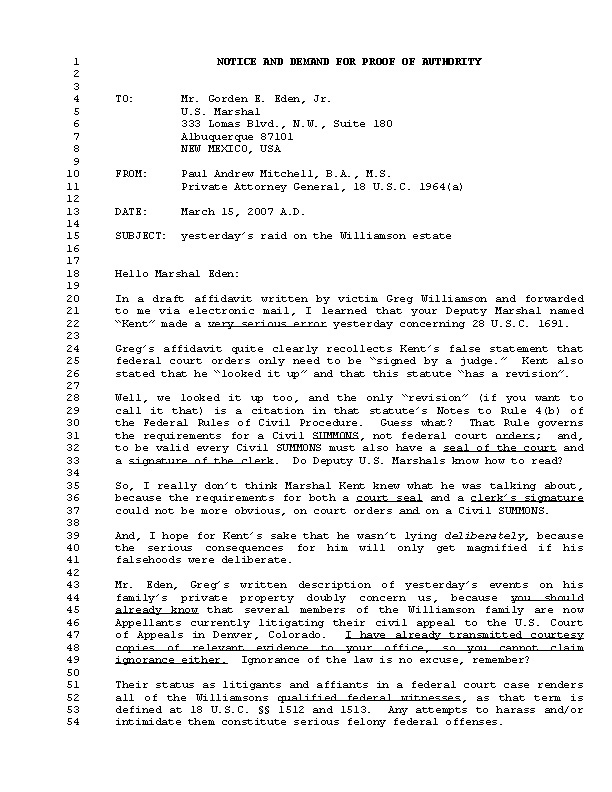 In a draft affidavit written by victim Greg Williamson and forwarded to me via electronic mail, I learned that your Deputy Marshal named “Kent” made a very serious error yesterday concerning 28 U.S.C. 1691. Greg’s affidavit quite clearly recollects Kent’s false statement that federal court orders only need to be “signed by a judge.” Kent also stated that he “looked it up” and that this statute “has a revision”. Well, we looked it up too, and the only “revision” (if you want to call it that) is a citation in that statute’s Notes to Rule 4(b) of the Federal Rules of Civil Procedure. Guess what? That Rule governs the requirements for a Civil SUMMONS, not federal court orders; and, to be valid every Civil SUMMONS must also have a seal of the court and a signature of the clerk. Do Deputy U.S. Marshals know how to read? So, I really don’t think Marshal Kent knew what he was talking about, because the requirements for both a court seal and a clerk’s signature could not be more obvious, on court orders and on a Civil SUMMONS. And, I hope for Kent’s sake that he wasn’t lying deliberately, because the serious consequences for him will only get magnified if his falsehoods were deliberate. Mr. Eden, Greg’s written description of yesterday’s events on his family’s private property doubly concern us, because you should already know that several members of the Williamson family are now Appellants currently litigating their civil appeal to the U.S. Court of Appeals in Denver, Colorado. I have already transmitted courtesy copies of relevant evidence to your office, so you cannot claim ignorance either. Ignorance of the law is no excuse, remember? Their status as litigants and affiants in a federal court case renders all of the Williamsonsqualified federal witnesses, as that term is defined at 18 U.S.C. §§ 1512 and 1513. Any attempts to harass and/or intimidate them constitute serious felony federal offenses. Moreover, and on a more fundamental level, Greg’s affidavit informs me that he was not served or otherwise presented with any ARREST WARRANT orany SEARCH WARRANT, despite being detained in handcuffs for several hours. Failure to obtain a WARRANT violates Greg’s fundamental Rights as guaranteed by the Fourth Amendment. In this context, please see the federal criminal statutes at 18 U.S.C. §§ 241 and 242. If our understanding of these facts is correct, then it is my legal and moral duty to inform you that your ten (10) deputy U.S. Marshals are now under formal investigation on suspicion of criminal trespass, extortion, false arrest, intimidating a federal witness, breaking and entering, use of excessive and unjustified force, and racketeering. Accordingly, formal demand is hereby made of you to disclose promptly by what authority(s), if any, the Office of the U.S. Marshal conducted yesterday’s raid on the Williamson property. Do NOT attempt to offer yet another photocopy of the so-called “order of sale” signed by U.S. District Judge Bruce D. Black, because the certified record before the Tenth Circuit has already confirmed that it lacked the seal of the U.S. District Court and the signature of the Clerk of that Court. See scanned copy attached. Also, within ten (10) calendar days from the above date, in order to avoid any personal liability in this matteryou must produce and transmit to my office true and correct copies of all ARREST WARRANT(S) and all SEARCH WARRANT(S), together with the requisite affidavit(s) of probable cause supported by oath or affirmation, and particularly describing the place(s) to be searched and the persons or things to be seized. See Fourth Amendment. Your decision to fall silent in response to this NOTICE AND DEMAND will activate estoppel, pursuant to Carmine v. Bowen. And, your silence can also be equated with fraud, because you have a legal and moral duty to answer, pursuant to U.S. v. Tweel. Thank you very much for your professional cooperation. Please remember that time is of the essence, and you now have ten (10) calendar days to satisfy all requirements as stated above.